Looking for Baroque music that shines both in terms of melody and treatment of harmony, but isn’t too “serious”? The disc is the Finnish Baroque Orchestra’s second release of Christoph Graupner’s (1683-1760) music, namely his Trio Sonatas (that aren’t really Trios). When I wrote on the FBO’s first Groupner release on his orchestral works, despite its all merits (including the cultural value of its publication), I just as an amateur, felt it was not without reason that Graupner’s music hasn’t survived to us as Telemann’s or Bach’s music has, perhaps due to his music’s seeming simplicity or similar less deep reason. After having been exposed to this new album for a while, containing Graupner’s chamber music for various small instrument combos, I find it harder and harder to exclude Graupner from the trio. So charming, so “à la mode”, so “logical” is music on this album that I have no problem in imagining how, during his lifetime, Graupner overshadowed even the God given Johann Sebastian Bach. 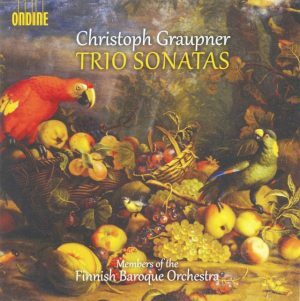 With over 2000 works, Graupner was similarly productive composer, whose cantatas, concertos and chamber music could be heard in solemn and secular venues. A featute that makes this new album so lovely and listenable is Graupner’s elaborate selection of instruments, including rarer ones such as the viola d’amore and the chalumeau, the predecessor to the modern-day clarinet. He really seemed to have an ear for timbres and how they fuse together, so much so that one starts to ponder that it’s some sonic aspect that gives the pieces their character as much as the “music” does. Once again Ondine has succeeded with the recording. The performance of the FBO in more than one line-up is exemplary, lively and rhytmically precise, which is a prerequisite for any serious musical enjoyment. The disc makes a useful reminder that Baroque music isn’t and wasn’t just about praising God but also about having fun in a civilized manner.